aShell Launcher for Android with Innovate Docbar and 3D Effects | Android Blast! Mobilityflow, developer of popular Android apps such as aTorrent and Animated Weather, announces the release of aShell Launcher, a new Android launcher developed in collaboration with Digital Mind Development Ltd (DMD). aShell Launcher is a beautiful and convenient alternative to default home screen of Android phones. Its key advantages are speed, stability, elegant Android 4 style and an innovative docking bar. The launcher has been designed with the users´ convenience in mind: the docking bar provides quick access to your call log, text messages, task manager and device settings. Another useful feature of aShell Launcher is the animated widget preinstalled on the main screen. It consists of two panels that represent current date and time, and in future versions it will display animated weather forecast with 3D effects. In the nearest future the developers of aShell Launcher plan to add several new features and make certain improvements: new effects, horizontal and vertical scrolling, support for landscape mode, support for tablets and more. It is possible for the user to request a feature, too! - Available in two versions: Free and Deluxe. 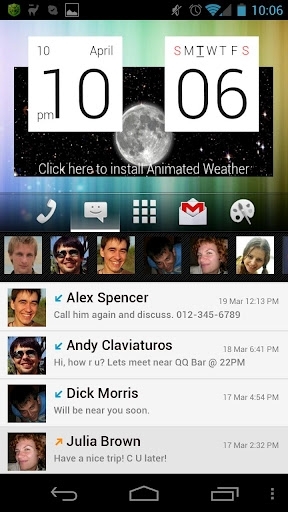 aShell Launcher works under Android 2.1 and higher. You can download the laucher on Google Play.